Stain Remover Guaranteed to remove any stain and odor instantly! Just spray it on, and watch your toughest stains magically fade away. The stain is gone, the smell is gone! STAIN REMOVER SALE - SAVE UP TO 40%OFF on selected cleaning products. SALE ends soon! Clean-n-Brite is the SUPER CONCENTRATED, degreaser, stain remover and odor destroyer that attacks the toughest stains; including red wine stains, pet stains, berry stains, mildew, mold, juice stains, coffee stains, ink stains, nicotine, ketchup, mustard, oil, kool-aid stains, grass stains, blood stains, iodine, betadine and many more. 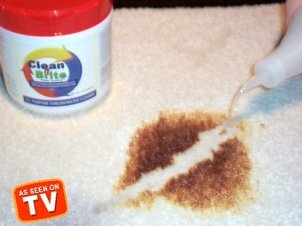 Now you can easily restore your stained carpet, upholstery, clothing and other household surfaces to a like new appearance. Quickly remove years of unsightly stains, spills and buildup on any surface effortlessly, just like a professional cleaner. Just spray and wipe, it's that easy. Clean-n-Brite's formula comes in the form of all natural Power Crystals and mixes with your own tap water to release its full cleaning strength. One 2.5lb pound jar of Clean-n-Brite makes a minimum of 100 gallons or over 400 spray bottles of all purpose cleaner, restorer, stain remover and odor eliminator. Newspaper Article - KEEP IT CLEAN - Although I didn't test it on all of the above, I did use it on darn near every surface in my kitchen - including the dirt embedded on the top of the refrigerator, long-ignored spills inside the refrigerator, fingerprinted cabinet doors, and a embarrasingly crusty stovetop - and it did a terrific job. Clean-n-Brite naturally attacks odor molecules at their source, instantly destroying odor causing bacteria and urine molecules safely, naturally and permanently. It removes the worst odors and stains. "Our cat urinated on the seat of my Rental Car while on our family vacation and with over 2,000 miles left to drive I was in a panic, I thought there was no hope. We borrowed some Clean-n-Brite stain remover from my sister and wow! It truly was a surprise... no more smells or stains instantly after just one application. Thanks for saving our vacation. You have a new customer for life!" Clean-n-Brite makes more stain remover for less money than any other advertised cleaning product on the market. And because Clean-n-Brite works so much better than those other brands you'll use less of it too. I needed to get my apartment super clean so I can get my deposit back when I move at the end of the month, and I have been using your product every day for several weeks since it arrived. It just melts dirt, grease, everything right off. It cleaned the blinds in just several seconds when I put 1/4 cup in a bathtub half filled with hot water and dipped them. I didn't want to waste it, so I started tossing everything that needed to be cleaned into the tub, and it just kept cleaning, even when the water started to look like coffee! Just a tiny bit on a damp cloth in the oven cleaned off all the crud and saved me from having to use toxic oven cleaner. My fridge looks brand new. This place is cleaner than when I moved in! I can't wait to get the furniture out and rent a rug doctor! I am getting jealous of the next tenant! I have been a walking commercial for Clean n Brite stain remover since it arrived several weeks ago. I'll be ordering another jar when I get in the new apartment, cause I don't think I will ever use anything else to clean with. Clean-n-Brite is strong enough to eliminate the toughest stains and cleanup the greasiest messes, yet it's gentle on your hands, eyes and lungs! Entirely safe and requires no special handling like so many other household cleaners and stain removers. No toxic fumes and it won't irritate your skin. Safe around children, pets and food. Clean-n-Brite stain remover is tough on stains! Its surfactants suspend dirt and grease so it easily wipes away using a cloth or a damp sponge. Clean-n-Brite handles all types of household cleaning tasks both indoors and out, yet it's gentle enough not to harm any surface. "I just wanted to tell you how desperate I was when I came looking for a product to clean my tobacco stained white coach. First of all, usually I have had my large sectional couch professionally cleaned for the last several years. approximately $(225.00) This last time they came to clean it and said it would not come clean. To add to the challenge, The black print against the white background bleeds through. What a mess. I was told by a friend to try Clean-N-Brite stain remover on it. I tried it this weekend and It looks very white and the black did not run. I was so excited. I was planning on throwing it out. Some of the really bad areas I just sprayed twice. It looks like a brand new couch!! It took out all the spots, stains, and all the yellowing stained areas from tobacco smoke. I was so amazed I have told everyone. It saved me so much money too!! Thanks for carrying such a great cleaning product." Tough stains on everything from shirts to carpet spills come right out with Clean-n-Brite. Just Spray it on the stain, and forget it! It's just that easy. Pre-treat your worst laundry stains for just pennies per gallon of cleaner. Replaces expensive laundry supplies. Stained carpets which would normally have to be professionally cleaned can quickly be removed with our stain remover. One jar of Clean-n-Brite will save you hundreds of dollars a year in laundry & carpet cleaning bills! Why hire expensive cleaning professionals? Do it yourself with Clean-n-Brite! "Our little girls broke their LAVA LAMP open on their light pink bedroom carpet. They had already spilled purple Sun Tan lotion this summer. Who wants tie-dyed carpet! I was skeptical of Clean-n-Brite's claims but I was surprised it really worked! The carpet looks like the stains never happened. Clean-n-Brite replaces all of those expensive pre-mixed cleaners found in your Grocery Store and it's concentrated so it saves you money! Stop spending $5 to $7 per bottle of toxic chemical cleaner. Clean-n-Brite is sold in the form of Concentrated Power Crystals so you can mix your own personalized cleaning solution, just the way you like it! Just add water and mix. Clean-n-Brite was developed for use in the Commercial Cleaning industry using years of research and on the job testing in some of the finest Restaurants and Hotels in the country. Just follow the easy to use mixing directions and you'll clean just like the professionals in no time at all. "I owe you an apology! I ordered your product to clean my stained popcorn ceiling, but I called the painters because I thought your product might not work. The product made the ceiling look like new. I simply sprayed it on and waited that was it, no more stains. If it can clean a restaurant ceiling that had years of smoke and black stuff blowing out of the vents it can clean anything. I cancelled the painters and saved a bundle. I plan to try it on my stucco house siding this week." Try Clean-n-Brite free for 30 days. If you don't agree that it's the best cleaner and stain remover that you have ever used, simply call us for a refund of the purchase price. There is no need to return anything! Keep the product as our free gift. It's that easy. We guarantee that Clean-n-Brite will remove dirt and oil build up on any surface instantly. It comes right off! Carpet dirt, grime, and stains will disappear with the powerful cleaning action of this product. Test the power of Clean-n-Brite and start cleaning responsibly for your health and the environment today!